With every passing day use of internet & networks is growing exponentially in businesses and it’s very important to have technical knowledge of networking architecture, networking functions, routing & switching which plays a key role in seamless communication across networks. This very much indicates how big scope & growth opportunities networking industry has to offer for a fresher after B-Tech. As per recent studies the demand of skilled networking professionals has gone up by 10 times in last 2 years. A networking professional has to acquire all necessary technical skills for designing a network, implementing & troubleshooting a network. And these skills are gained by attending networking courses, to be specific Cisco Certification Courses. Cisco offers Certification Courses in multiple technologies but most demanded technology is routing & switching. These courses are delivered by Cisco authorized training institutes, Also Cisco Certifications have 3 levels – CCNA “Associate Level”, CCNP “Professional Level” & CCIE ”Expert Level”. Let’s look into CCNA Certification today. CCNA (Cisco Certified Network Associate) is the first step in the world of networking for all aspirants. And it has been specifically designed to build strong technical knowledge base of entry level network engineers. Such technical courses require high quality training atmosphere and that’s what Network Bulls offers. Network Bulls – India’s No.1 Cisco CCNA, CCNP & CCIE Training Institute offers brilliant Summer training Course of CCNA R&S to make best use of this time. This month long CCNA R&s summer training program will cover Cisco routing & switching basics, IP Addressing schemes and WAN Technologies. Anyone completing this CCNA Certification will have skills set to install, configure, implement and troubleshoot small as well as medium size networks. Network Bulls CCNA R&S Course follows Cisco authorized course curriculum and study materials have been drafted accordingly. Because of its amazing learning environment and training approach, Network Bulls has become North India’s No.1 choice for CCNA R&S Training. CCIE Certified Trainers, World’s Largest Cisco Training labs fully loaded with REAL devices, 24x7 lab access & support makes Network Bulls an unbeatable choice. With 100% practical training focus and Live Project based summer training, Network Bulls makes sure you learn what you study in theory classes. In fact theory classes are also equipped with devices for real time demos. 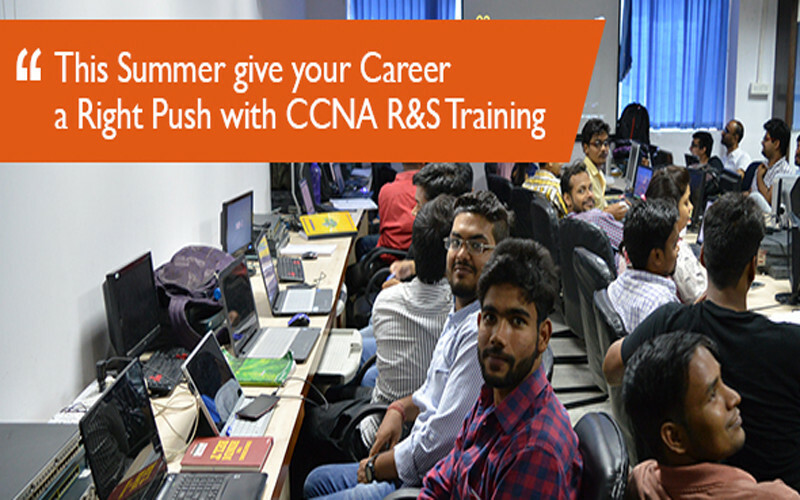 All this makes Network Bulls a perfect training Institute to give your career a right push with CCNA R&S summer training. Apart from CCNA R&S 1 Month Summer training, Network Bulls offers 2 months and 6 Months Cisco training courses as well. 2 Months Summer Training Course covers CCNA R&S + CCNA Security and 6 Months training covers all 3 levels of Routing & Switching Technology i.e. CCNA R&S, CCNP R&S and CCIE R&S. 6 Months summer training option also has 100% Job Placement Guarantee to every student. Wow? A Cisco Training Course with 100% Job Guarantee in India. Perfect option to make your career fly. To See All Summer Training Courses Click Here. To know more about Summer Training in Network Bulls, Delhi/NCR Speak to our Career advisers by calling to toll free number – 1800-313-2545 or drop us a query on admin@networkbulls.com.